Do you have questions about Indexed Universal Life Insurance? Are you interested in Orion IUL, the new product from Securian? Now there's an easy way to get answers to your questions through the "Ask the Actuary" live online events. Join the actuary that created the patent-pending Cash-Value Amplifier, which is prominently featured in Orion IUL. 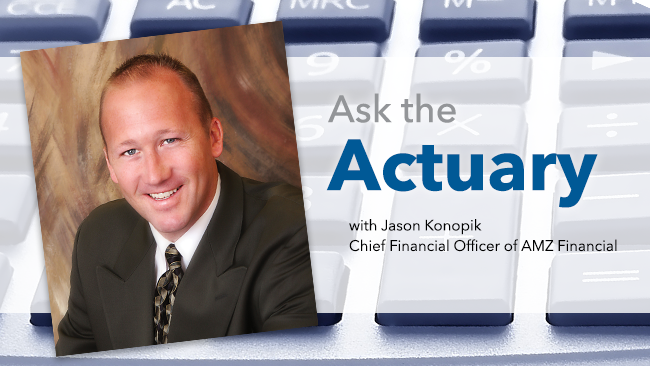 Jason Konopik is the Chief Financial Officer of AMZ Financial and has over 15 years experience in the life insurance industry. Jason relies on his actuarial, investment, and general insurance knowledge, in addition to his relationships with successful producers, to provide product development support to carriers AMZ represents. He has had a hand in the development of many of the most popular indexed life products sold in the last decade. In addition, he is an advocate of field education and has trained thousands of agents on the power of indexed products. Jason is hosting live online presentations on the following dates. If you have questions for Jason about Orion IUL that you'd like him to answer during the presentations, please leave them in the comments below. What is the most common concern your clients have about IUL?